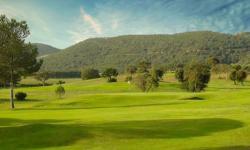 Golf de Lezza in Porto-Vecchio, Corse-du-Sud, Corsica, France offers a slightly hilly terrain and is a 9 hole, par 64 course over 11 hectares ideal for a technical golf game which is varied with greens of medium difficulty. 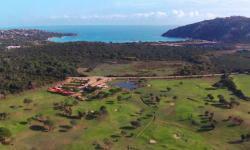 Challenging and offering excellent play for experienced golfers as well as average golfers and beginners, the course is suitable for all levels, and with many configurations offers breathtaking views over the bay of Santa Guilia. Golf de Lezza also features a clubhouse on the edge of a pond with bar restaurant and pro shop, there's also a seminar room and men's and women's locker room with showers, it's all here for a great game.